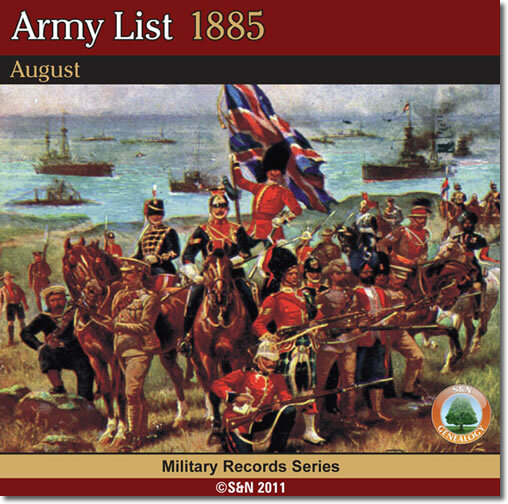 This CD contains a vast amount of information, including schedules of Generals and Field Officers by rank and regiment. As well as a multitude of territorial regiments, officers are included for cavalry and artillery regiments, Royal Engineers, West India regiments, Marines and volunteer battalions. A more unusual listing is the Channel Islands Militia, with officers from Jersey, Guernsey, Alderney and Sark. The Royal Sark Artillery has two Captains, name T Le Mesurier (1853) and W F Collings (1873). The volume rounds off with fascinating advertisements. Among them are J W Allen of the Strand, London, who manufactured barrack room furniture, and Ross & Co, who are described as specialists in military field glasses and telescopes.